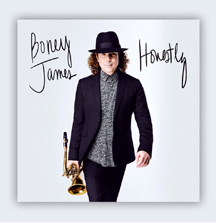 Four-time Grammy® nominated Jazz Saxophonist Boney James has a fabulous new release entitled Honestly out on the Concord Music Group label. Boney James collaborated with Brandon Coleman, Jairus Monee, Malcolm Eric Murray, David Bonilla, Denise White, Dana Johnson, Tim Carmon, Francois Dean, Jr., Herman Jackson, Eric Roberson, and Darrell Smith to write 9 of the 10 songs on the release, and together with a talented ensemble of musicians, and vocalists Avery* Sunshine and Eric Roberson, they have created a noteworthy release destined to gain critical attention. Boney James produced his latest release, Honestly, on the Concord Music Group label, due for release on September 1, 2017. Honestly marks the 16th exciting release of his 25-year career. Originally from New Rochelle, New York he makes his home in Los Angeles with his wife Lily Mariye. The release opens with the free-flowing instrumental track, Kicks, written by Boney James and Brandon Coleman. Players include Boney James - soprano saxophone, keyboards, Brandon Coleman - keyboards, bass, drum programming, Kendall Gilder - guitar, Omari Williams - drums, and Lenny Castro - percussion. The release continues with On the Prowl - written by Boney James, Malcolm Eric Murray, and David Bonilla, which aptly captures the feel of a jungle cat "on the prowl." Players on this track include: Boney James - tenor saxophone, keyboards, Nutty P. beats - keyboards, drum programming, key bass, David Bonilla - synths, drum programming, Kendall Gilder - guitar, and Tim Carmon - B3 organ. Low and Slow, written by Boney James and Jairus Mozee, is exactly how it sounds, so sit back, relax, and take it easy for this one. Players include: Boney James - tenor saxophone, Jairus Mozee - guitar, keyboards, bass, drum programming, Tim Carmon - B3 organ, Lenny Castro - percussion, Boney James, Smitty Smith, Kenny Barnes, Dave Rideau, and Omari Williams adding handclaps. The release segues into the title track, Honestly, written by Boney James, Denise White, Dana Johnson, Tim Carmon, featuring the fabulous vocals of Avery* Sunshine. Other players for this track: Boney James - tenor saxophone, keyboards, drum programming, Rob Bacon - guitar, Tim Carmon - keyboards, key bass, and Lenny Castro - percussion. Put on your dancing shoes for the track, We Came to Party written by Boney James, Jairus Mozee, and Francois Dean, Jr. which has a decidedly fun disco feel to it. Boney James adds tenor saxophone and keyboards, Jairus Mozee adds guitar, bass, drum programming, Francois Dean, II adds vocals, and Omari Williams contributes hi hat on this lively number. Speak Easy written by Boney James and Herman Jackson follows, with horn arrangement by Jerry Hey and Boney James. Players on this big-band sound include Boney James on tenor saxophone and drum programming, Kendall Gilder takes over on guitar, Herman Jackson plays keyboards and key bass, Lenny Castro layers in percussion, with Bill Reichenbach on trombone, Dan Higgins plays saxophones, Gary Grant plays trumpet, and Boney James' wife, actress/director Lily Mariye is the foley artist. Next, Boney James and Darrell Smith do justice to the 1942 Johnny Mercer and Hoagy Carmichael song, Skylark, with Boney James on tenor saxophone and keyboards, and Darrell Smith on keyboards. Boney James teams up on the writing with Eric Roberson and Darrell Smith for the track, If I Can't Hold You, featuring the dynamic vocals of Eric Roberson, with Boney James adding tenor saxophone, keyboards, key bass, and drum programming, Darrell Smith on keyboards, Jairus Mozee on guitar, and Lenny Castro adding percussion. The release closes brilliantly with the up-tempo, punchy track, Up All Night, a Boney James and Jairus Mozee collaboration with horn arrangements by Jerry Hey and Boney James. Boney James plays tenor saxophone and keyboards, Jairus Mozee layers in guitar, keyboards, and drum programming, Tim Carmon plays B3 organ, Smitty Smith adds bass, Omari Williams is the drummer, Lenny Castro on percussion, with a lush horn section of Bill Reichenbach on trombone, Dan Higgins on saxophone, and Gary Grant on trumpet. Websites where you can procure Boney James - Honestly: Amazon and iTunes. © August 2017. Luxury Experience. www.LuxuryExperience.com All rights reserved.